Since the groundbreaking Original Pronunciation productions at Shakespeare’s Globe in London in 2004-05, OP has captured the imagination of performers, directors, and the play-going public. Going back to the pronunciation of the late 16th and early 17th centuries reveals nuances, puns, and rhymes that otherwise lie completely hidden, and gives fresh dynamism to productions. Over ten years, David Crystal has constructed an entire dictionary of Shakespeare’s Original Pronunciation – with guidance on how every single word in the First Folio would most likely have been heard by Shakespeare’s audiences. We spoke to him about how a philologist reconstructs the way language was spoken 400 hundred years ago, different sources of evidence, the effect on modern audiences, and what OP sounds like. One source of evidence is the spellings Shakespeare used, such as the Queen Mab speech in Romeo and Juliet. Sixteenth century books on grammar and language – by Ben Jonson and others – give evidence on how Shakespeare’s plays would have sounded in their day. Productions of Shakespeare using Original Pronunciation resonate with modern audiences in exciting ways, including the United States, Canada, Lancashire, Ireland, and London. So what does it sound like? Listen to the Prologue to Romeo and Juliet below. Featured image: The Globe Theatre. CC0 via Pixabay. David Crystal is known throughout the world as a writer, editor, lecturer, and broadcaster on language. His work on the language of Shakespeare includes Pronouncing Shakespeare (CUP, 2005), Think on my Words: Exploring Shakespeare's Languages (CUP, 2008), and, with Ben Crystal, Shakespeare's Words (Penguin, 2002), The Shakespeare Miscellany (Penguin, 2005), and The Oxford Illustrated Shakespeare Dictionary (OUP, 2015). 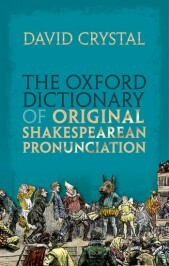 His new book is The Oxford Dictionary of Original Shakespearean Pronunciation.